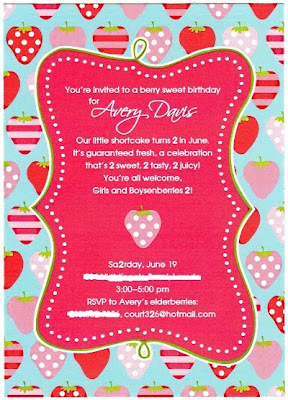 Check out this adorable invitation Mary Jo of What's Inside Designs put together for Avery's party! She pulled together the theme, wording, and fabric print so perfectly. My sister helped with the fun wording. I love setting the stage for a party with cute invitations, and these certainly did the trick. Can't wait to see how the party turns out! I had fun working with you on yet another party! Looking forward to actually attending these one year! :) Happy Birthday, Avery (and Todd!). What a cute invitation. Happy Birthday Miss Avery! Hope you had a good day!